The lighting industry offers many different lighting fixtures to play with. From the simple parcan to the wonderful world of moving heads, the way to operate those fixtures may be very different. One thing they have in common though is the DMX protocol, which sends commands to many types of lights. One DMX channel (or value) represents a number from 0 to 255, which in computing terms is an 8-bit number. When a fixture receives this number, it may be converted to light intensity or pan or gobo index... It is up to the fixture to do something with a DMX value. For example: A 4 channel dimmer pack listens to 4 DMX channels and converts each one to an intensity output. An interesting thing to note is that in order to have really smooth transitions, more than 256 DMX steps (0 to 255) can be achieved by using multiple DMX channels to represent a value. By combining two channels, you get 65536 steps (256 times 256). This is called 16 bit resolution. 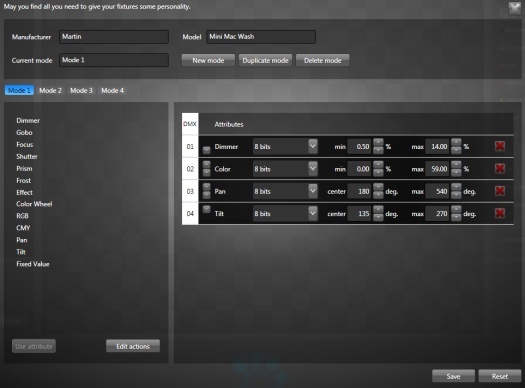 A fixture DMX template or personality abstracts the DMX value representations and lets you work with more logical terms like intensity in percent, pan in degrees and gobo index. Let's see a video tutorial showing how to create a new fixture template/personality from scratch. In this case we create the template for the Martin Mac 101. 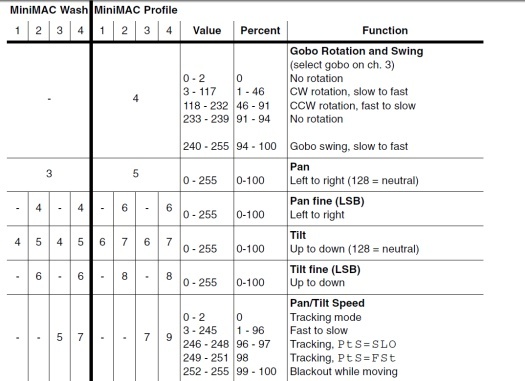 The first thing you need to have when creating a fixture personality is its DMX protocol sheet. This sheet usually comes with the fixture. A fixture may have multiple modes and the DMX addresses may differ for each mode. You can find many DMX protocol sheets on the Avolite website. You can access the fixture template editor by going to View/Template or in the patch window to select an existing template to edit. Lightjams only needs really basic information about your fixture in order to operate. So the process should be quick enough. Manufacturer and Model: Name your fixture. Current Mode: The name of the currently selected mode. The bottom of the window shows this mode configuration. DMX Panel (right): Here you see what is assigned to each DMX channel. Use the up and down arrows to reorder attributes. 16 bits MSB and LSB: When using high resolution capability, you have to choose between MSB (most significant byte first) and LSB (least significant byte first). This should be specified on the fixture DMX prococol sheet. Most fixtures use MSB. 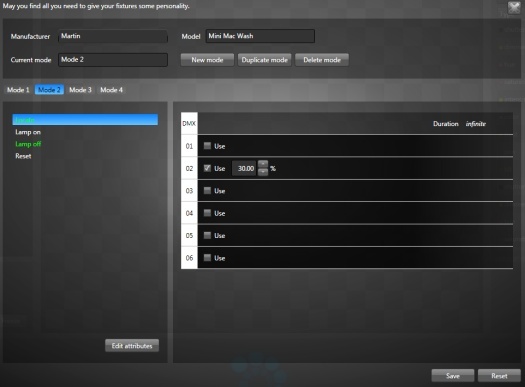 A good approach when a fixture has multiple modes is to create the first mode and use the duplicate mode button. Then select the new mode and most of the time you'll need to change only a few settings like selecting 16 bits instead of 8 bits for some attributes. You can configure your fixture actions by clicking the edit actions button at the bottom of the capability panel. For each action, you can select the DMX channels used and enter a fixed value. Once an action is configured it appears with a green text. Each mode has his own actions since it has different DMX channels. Reset: Reset... Mosly for moving heads to recalibrate the motors. You can trigger these actions in the patch window when selecting fixtures. A capability is a general fixture feature like RGB color mixing. Once a fixture has been patched, you work with the attributes derived from the fixture capabilities. For example, three attributes are derived from RGB color mixing: hue, saturation and intensity. Here's a list of all supported fixture capabilities. You can find more information about the parameters after the table. dimmer dimmer resolution, min, max The most basic and versatile capability. This is simply a 0%-100% attribute and is modulated by the master intensity. Merged using HTP. color wheel, gobo, gobo rotation, focus, shutter, prism, frost, effect, zoom same name as the capability resolution, min, max Common capabilities of the same family. Merged using LTP. iris iris resolution, min, max Merged using HTP. pan, tilt same name as the capability resolution, center, max Used for moving lights. Merged using LTP. RGB, RGBW, CMY, CYM (Varilite) hue, saturation, intensity resolution Hi resolution color support (16 bits per channel). In Lightjams, the color mixing is always happening in the HSI color model. The intensity attribute is merged using HTP, hue is merged using special HUE mixing and the saturation using LTP. When the fixture doesn't have a dedicated dimmer channel, the intensity attribute is modulated by the master intensity. fixed no attribute resolution, value This special capability can set a constant value for some DMX channels. This is used for special purpose channels like effect speed when you always want to set it to tracking in order to have total control in Lightjams. resolution: 8 bits, 16 bits MSB or 16 bits LSB. The 8 bits resolution is the most common value. This means you can use 256 steps or levels to control this attribute. If you need more resolution in order to achieve smoother transitions or movements, then you can use the 16 bits resolution, meaning the attribute will use two DMX channels. MSB: the first DMX channel is the most significant also called Hi byte or coarse value. LSB: the first DMX channel is the least significant also called the Low byte or fine value. In both MSB and LSB, the two DMX channels must be consecutive. The total number of DMX channels for a capability is the resolution times the number of attributes. For example, RGB with hi resolution takes 6 DMX channels. min(%), max(%): Restrain the valid DMX range to be used for this attribute. This is commonly used with multipurpose channels like shutter in order to avoid the activation of special features like lamp on, reset and even strobe effect since it is fairly easy to do it in Lightjams. center(°), max(°): Used for pan and tilt capabilities to set the default center position and the maximum rotation angle in degrees. When using different types of moving lights, Lightjams will compute the proper DMX values corresponding to a degree value. HTP merging: Highest value takes precedence. When you use multiple times the same attribute on the same or different grids, the attribute may receive multiple source inputs. With HTP merging, the final attribute value will be the highest input value. HTP is commonly used to achieve intensity cross-fades. LTP merging: Latest value takes precedence. In Lightjams, this rarely happens contrary to HTP. The cleaner way to set precedence rules is by using the grid precedence property. This way, when multiple grids target the same LTP attribute, the highest precedence grid will win.